Empire Minecraft Servers | No Griefing! Want to play Minecraft your own way? Look no further than Empire Minecraft! We specialize in a Survival Server Style, with Vanilla like gameplay, but extended features! Most minecraft servers either classify themselves as vanilla or non-vanilla. We’ve been dubbed by many of our loyal members as a ‘French Vanilla’ server. Despite having one of the most custom experiences you’ll ever find on Minecraft servers, you’ll always have that ‘Just Outside Vanilla’ feeling. Whether you’re all about braving it in the wild to gather resources for your amazing build, while running into Custom Mobs and challenges, or you want to dominate the market by having the best mega mall and shop in Town, the Empire has everything you need and more! Don’t take our word for it, read the player testimonials on the right and come see for yourself! On EMC, we offer numerous play styles to choose from. Live in the Frontier, fighting monsters and building in the natural Vanilla world terrain! Play on Easy or Play on Super Hard! Choose your own difficulty level, and reap rewards for making it harder. Become a collector and collect our vast amount of special items only found on the Empire, including numerous limited edition Promo Items! Compete in our staff ran events and contests! Mob Arenas ran multiple times a week! Strive to become an Empire Contributor, YouTuber or Build Team member and help the Empire! 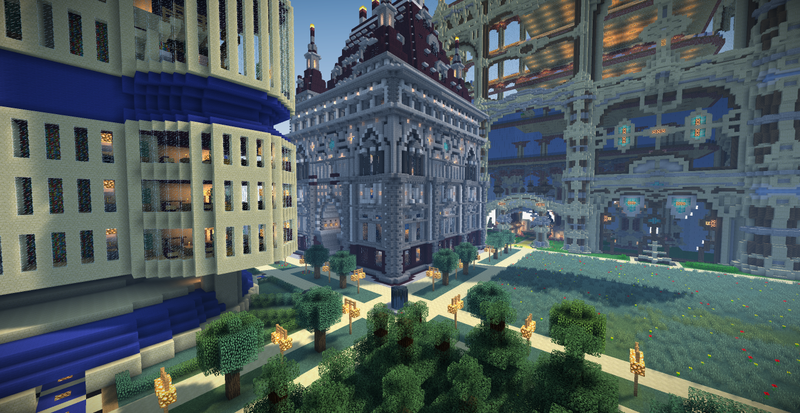 And more… what can you create on the Empire Minecraft Servers? Many of our features include “Player Settings”, a special menu where you can personally control how things impact you on the Empire. For example, Personal Player Difficulty means 2 people fighting creepers side by side have very different experiences. One will kill the creeper easier than the other if they have a lower difficulty level! This lets you control how you prefer to play, challenge or not. It is truly “Play Your Way”. The empire hosts up to 200-300 players online concurrently every day, divided over 10 servers! Switching between servers is easy, but you can become a apart of each SMP’s sub community, and meet new friends. Because of our split up design, it lets smaller sub communities grow and prosper. Our Chat communications are very clean, enabling you to really get to know everyone online on a server. This lets you easily make new friends and create a strong bond to your home SMP. The community is what makes Empire Minecraft. Empire Minecraft has a large Mature and friendly staff team, mostly consisting of adults. Many of our staff play the game with their children on Empire Minecraft, so we understand parents concerns about seeing swearing and adult chat! Empire Minecraft has set rules for a “PG” Level of chat rules, and will remove the ability to chat from anyone who breaks these rules. We do our best to block known badwords from being said, but those who try to get around it will be punished! Empire Minecraft has a professional development team of adults who do software development for a living. We have a long term road map, meaning that there will always be constant innovation and new experiences! You can expect the quality of the content on Empire Minecraft to be extremely professional. You can expect this server to be around for years to come. Many servers constantly change the features they have every version update, removing a plugin because it is not compatible with the latest version. At Empire Minecraft, we design all of our features with care and will rarely ever change or remove a feature for the negative due to a version update! So you can rest assured the gameplay you experience will continue to be there, through every single version update. We will only remove a feature if it is absolutely necessary or has no real opportunity to keep it and perform the update due to changes out of our control. Barely any other server is as stable as Empire Minecraft.